Resident Senior Citizens are eligible for additional interest of 0.50%. For NRI Term Deposits, for maturities from one year to three years the rate offered is 9.00%. Above three years the rate is 8.75% The above rates are effective from December 24, 2012.
close on January 2, 2013.
colleges with just one test. leader in career education, it has over 1300+ centers of learning across the world. Solutions, Aptech Assessment & Testing Solutions). GAIL GAS PIPELINE PROJECT has initiated the issue of crop compensations to the land owners hin Kerala and the first set of crop compensations have been handed out to the land owners of Poyya village of Kodungallur taluk in Thrissur. The Deputy Collector Sri. M Anil Kumar along with Sri. M S Sreedharan (Revenue head Spread I Thrissur) handed over the first cheque for Rs 377520/- to Sri. Benny Alex a resident of Poyya Village. Mumbai: Federal Bank has offered Employee Stock Options for the second time since the Bank implemented the Employee Stock Options Scheme in 2011. The grant in 2011 was at Rs. 420.65 and at Rs. 474/- in 2012. The unique feature of the Scheme is that it covers all permanent employees of the Bank, which means from the junior most award staff till the Managing Director get an opportunity to own the Banks stock. While the spirit of the scheme is to enable all employees to become proud owners of the Bank in which they work, it is worth noting that the market has displayed immense faith in the Bank’s performance and its potential to grow and remain profitable. At the time of reporting the share price of Federal Bank stock stood at Rs.542. It may also be noted the Bank that had crossed the landmark of having over a 1000 branches in the country in October 2012, has recently crossed another landmark in having over 10000 employees on the roles of the Bank. The ESOS is seen as part of the Change Management process, for the Bank to successfully participate in the highly competitive employment market of the Banking Sector. The senior management of the Bank realizes that employees enjoying proprietary interest in the institution in which they work makes them naturally loyal to the establishment and this leads to retention of talent. About Federal BankFederal Bank is a leading Private Sector Bank with a branch network of 1023 branches and 1,135 ATMs spread across the country. The Bank had total business of Rs. 86,693 crore as at March 31, 2012. It has Net Worth of Rs. 5,706 crore as at the end of fiscal 2011-12. It recorded net profit of Rs. 776.79 crore during the last financial year. Federal Bank has its Representative Office at Abu Dhabi that serves as a nerve centre for NRI customers in the UAE. Federal Bank is transforming itself, keeping its principles intact, into an organization that offers services beyond par. It has a well defined vision for the future as a guidepost to its progress. IT/ITES sector, young entrepreneurs made a beeline for it. Kaloor, right at the heart of Kochi. development is estimated to be Rs. 237 lakhs. commissioning 23 new IT/ITES units employing up to 150 people will be soon operational at the centre. IT/ITES with 65 independent IT units. government that continues to pay for itself in terms of job creation and tax base appreciation. entrepreneur who has to arrange only the internet facility on his own, apart from paying the license fee. Public parking is available a few hundred feet from the building. developing more IT units in the state. Kochi,December 4,2012: ThinkLabs Technosolution Pvt Ltd, today conducted TRICKS 2012 at IIT Mumbai for over 600 students from across the country. This is the 5th all India robotics competition open for any school children. For TRICKS 2012, 150 teams from across the country participated in the competition that spanned over 2 days. After a gruelling competition, Aura Edify Global School and Wisdom High School from Nasik were announced winners for the junior and the senior category respectively. 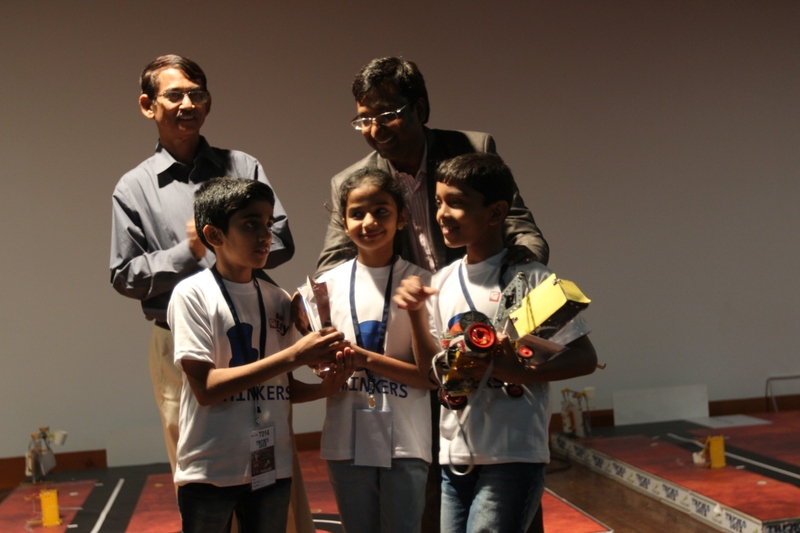 The winners were chosen by a panel of judges on the basis of not only on how well they were able to make their robots perform but also on their presentation skills and team spirit. The top teams from each category received a cash prize of INR 50,000 each. The teams at the second and third positions under each category received a cash prize of INR 20,000 and INR 10,000 respectively. There were cash prizes given for best algorithm, best design and best presentations as well. The theme for this year’s ‘TRICKS2012’ was ‘Mars Exploration Mission ’. Keeping to the theme, teams were given a task chart, designed to ensure that the robots would be able to help in understanding Mars, its weather cycle, soil structure and hence facilitate future missions. This year, like before, the teams were divided into two groups on the basis of their age. Any student from 1st to - 5th standard could participate in the junior school category and students from 6-12th standard could participate in the senior school category. Each group was given a given a pre- defined task list, based on which they create and plan their strategies for the competition. The task list acts as a broad guideline and a student is free to experiment along those lines. For the current year, TELE MARS, the task for the junior team, was to build a remote controlled Mars explorer. At this level, the student was expected to build a robust machine which travels different terrain, pick and place objects, climb inclines and so on. The key judging criterion was to build robots that can be easily controlled by remote control. AUTO MARS, the task for the senior team, was to build robots that follow a line and can intelligently perform various tasks on the way. The important criterion was its ability to use sensor and make decisions. Reliability and repeatability of the robot were crucial in the judging process. On the 1st day of the competition, the teams had a qualifying round. The objective of the qualifying round is typically not to eliminate but to help the student identify and significant flaw in their design and assembling. On the 2nd day, the teams made their final presentation to the ThinkLabs judges and the final teams were selected on the basis of the performance and consistency of the robots and over all team presentation. ThinkLabs started TRICKS in 2007 with the intention of enhancing the interest of students and also the teachers in robotics. Over the years and annual competition has become a platform where students from various schools come and display their learning and enthusiasm on the subject. ThinkLabs plans to take the robotic competition to other countries as well in due course of time. ThinkLABS is a IIT-alumnus venture in the field of hands-on science and technology education catering to schools and colleges. Since its inception in 2006, the company has grown significantly and today partners with over 200 schools and 40 colleges across India. ThinkLABS world-class award winning innovative programs introduces school students to hands-on science education through robotics and science implements. Cutting edge programs in embedded systems and robotics and is aimed at preparing college students for careers in the new frontiers of technology. Mahindra Group, continued to build its presence in the two wheeler segment. units. Cumulative sales from April to November 2012 stood at 79,910 units. The cumulative sales for the company have crossed a landmark figure of four lakh units. is the Indian woman’s two-wheeler of choice. rural prosperity, enhance urban lifestyles and increase business efficiencies. logistics, real estate, retail, steel and two wheeler industries. listed companies in the world. Kochi, 3rd December 2012: AVT Natural Products Ltd, Cochin has been recognized by Forbes as one among 200 best companies from Asia-Pacific region with under $1billion revenue. 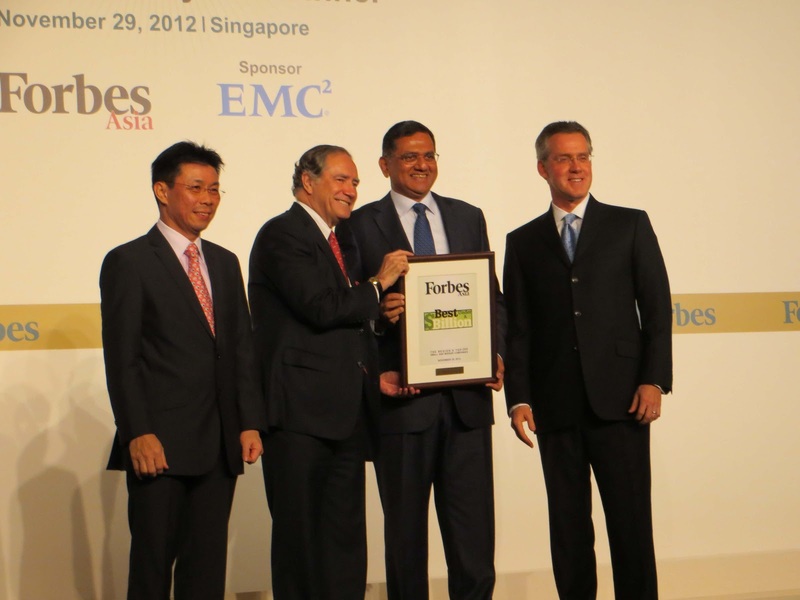 The award function held in Singapore on 29th November, 2012 to honour the Companies of this elite list was attended by dignitaries from around the world. 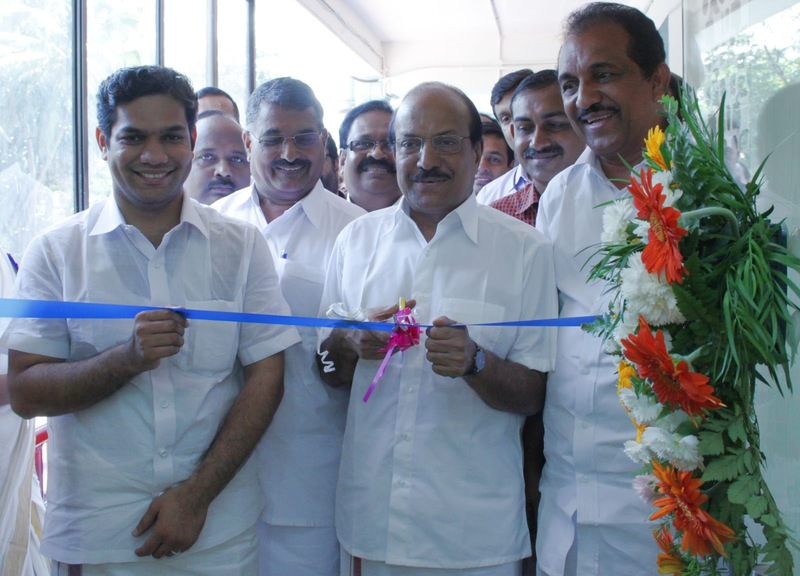 Mr. Ajit Thomas, the Chairman of AVT Natural and Mr. M.S.A. Kumar, the company’s Managing Director represented AVT Natural in this grand function. Mr. Ajit Thomas received the prestigious award from Mr. Christopher Forbes, the Vice-Chairman of Forbes Media LLC. The list published on August 18, 2012 is based on the financial data of the preceding 12 months. AVT Natural with US$ 47 Million (Rs 260 Crores) Sales, US$ 11 Million (Rs 60 Crores) Net Income and US$ 52 Million (Rs 290 Crores) Market Capitalization, is one among 23 companies from India to find a place in this esteemed list. AVT Natural is part of AV Thomas Group of companies based in South India. The list recognises the importance of small and medium enterprises in powering the Asia-Pacific economy. It comprises of companies from China & Hong Kong (72), India (23), Taiwan (23), South Korea (16), Malaysia(14), Australia(14), Vietnam(8), Indonesia(7), Thailand(6), Japan(4), Singapore(4), Philippines(3), Pakistan(3), Sri Lanka(2), and New Zealand(1). The final list of 200 awardees was selected from a universe of 15000 companies from Asia Pacific region. Only publicly traded profitable companies with revenue greater than $5 million but less than $1 billion were considered for the list. It was further trimmed down based on business performance indicators like sales and earnings growth as well as the return on equity delivered in the preceding 12 months and over three years. The list was further scrutinized to remove companies which are thinly traded on the stock exchanges and those facing accounting or major legal troubles.